This past Memorial Day weekend, I went to A Dark Gathering and played a crap-ton of Call of Cthulhu, certainly more than I’ve ever played before in a 48 hour period. A Dark Gathering modeled itself on a troll hoot, a micro-convention of friends who descend upon a conveniently placed hotel to spend the weekend role-playing. In this case, we met about halfway between the furthest flung contingents, putting us just outside Syracuse, New York for a weekend of horror gaming. All the gaming went down in a pair of suites — really larger sleeping rooms with floorspace for a banquet table and ample chairs each. There was a rough schedule of who would run what when. Nothing before the afternoon, so there was plenty of time for late night socializing and long-running scenarios. This was a welcome change for me, because I usually find myself rushing around in the early morning, particularly when working Carnage. My body wakes up on its own schedule regardless of when I go to sleep the night before, but having the morning to myself each day was most welcome — and even then, I still took Saturday night off. Turns out surviving a weekend of ample socialization without becoming visibly cranky means I need to block out plenty of me time. 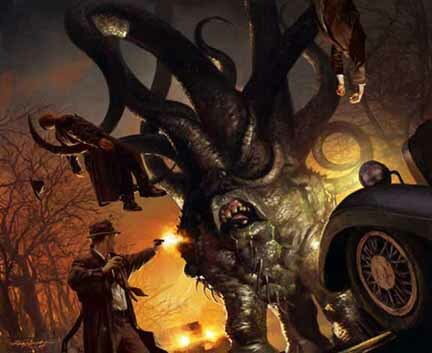 I myself played in three Call of Cthulhu scenarios, each with a different GM and style. Friday evening, Andre Kruppa ran “The Burning Stars,” a scenario from Chaosium’s Terrors from Beyond anthology in his super theatrical style with lighting, music cues and props that help set the mood for some grim role-playing. That was the first time I needed a flashlight to check my character sheet or read the dice. Saturday afternoon’s “Any Port in a Storm,” run by Robin Lea, was a palate-cleanser in that it was more of a whimsical set-up with investigators for a paranormal reality show getting caught up in extra-dimensional hijinks — mind you, more than half the group still died, two from in-fighting and one from failure to unplug first, but it was all in good fun. I was completely unsubtle about my character’s secret in this one and enjoyed it immensely. Sunday afternoon I played in Tom Loney‘s “Fever Dream,” where the traditional set-up of being called to your dying uncle’s house ends much as one might expect in the Call of Cthulhu milieu. While I took notes on all three games I played because it’s become habit by now, I’m on the fence about recapping them in as much detail as I have been the Pathfinder campaigns. That’s a lot of recapping and I find myself being more sensitive to spoiling scenarios that aren’t readily accessible as purchasable products for some reason — and there’s a huge cult of secrecy around Andre’s games, even when they’re published scenarios. The hoot model has a lot going for it: small, intimate, loosely organized, relatively easy to arrange and potentially more affordable than a typical convention weekend. The flip side of a closed gathering is there’s less opportunity for the serendipity of discovering new games by wandering by a table. The interaction of extended networks can replicate that, though. A Dark Gathering was a fun, tiring weekend. I got to hang out with friends I don’t normally see, make some more and do way more role-playing than I normally get to. N.b. Tom’s written his own account of the weekend in five parts. Robin’s record has pictures. And home of the Dinosaur BBQ, a restaurant I adored in my college days. That was a strong motivator, I can’t deny. Until such time as I can write up the events of last night’s Masks of Nyarlathotep session, enjoy this missive from Lothar von Fasselstein, attached to his last will and testament as a final message to his assistant, Sophie Hawkins, but somehow loaded with information revealed only moments before his death. Also, who knew his outrageous German accent carried over into the written word? Now zat I haff left you alles of mein vorldly possessions, I can rest assured zat ze Professor Lothar von Fasselstein Memorial Library und ze Professor Lothar von Fasselstein Chair in Egyptology at ze unifersity of Oxford shall be in gut hands! Ven you hire ze sculptors und ze painters for ze artistic exhibition section of ze Memorial Library, please take care zat zhey capture mein likeness from ze right side, vhich is mein gut side. Alzo, ze Eternal Flame in ze courtyard memorial zhould be beneath the memorial arch, not before – I know, I know, ze plans show differently, but I haff changed mein mind. Zhe gardens surroundingk mein grave can be of any type you prefer, but I do like ze lilies und ze lilacs. I am assured zat you zhall be ze very best administrator of mein legacy imaginable, you haff been ze best of research assistants, und zhese skills zhould serve you vell in dealingk viz ze unifersity administrators, ze city planners, ze legislatures of New York und mein native Nuremburg to establish ze Professor Lothar von Fasselstein Medallion to be given to ze most deservingk student of Egypt from ze city’s unifersities und alzo ze best enemy of ze cults. Ja, ja, in fact – uze zome of ze money to make sure zat ze cults get a gut punchingk in ze face. If you do not vant it, perhaps you can giff somevone mein shotgun – I sink Herr Spadowsky vhould like it, ja? For ze cult shootingks. Alzo, und zhis is fery important! I vish to be buried viz ze head of Edvard Gafigan. Under mein foot. Thanks to Dan, Lothar’s player, for not only allowing this to be published on Held Action, but having the inspiration to write it in the first place. Lothar was easily the most colorful and amusing character in the campaign to date. He will be missed.